Building and rigging period plastic ship models are the most challenging aspects of building plastic kits. Find the best age-of-sail kits available from Heller, Airfix, Revell, Lindberg, and Academy. Among plastic ship models, I think it's fair to say, sailing ships are the most challenging of all. It's not that gluing the plastic pieces are any different than any other type of kits, it's the rigging that will test your skill and your patience. One of the bigger plastic model ships on the market today - Lindberg's Sea Witch in 1:96 scale. 2. The rigging on plastic ship models of a smaller scale generally have simplified rigging. For instance, you seldom see blocks on 1:200 scale or smaller model ships. This is somewhat counteracted by the fact that a larger model leaves more room to tie knots and easier to see what you're doing. So if you are relatively new to plastic ship models in general, build a smaller kit before tackling Revell's 1/96 USS Constitution or Heller's HMS Victory. To represent the canvas sails are made of has proven a difficult task for the plastic kit manufacturers. Some don't even provide anything at all. To me that's a cop-out. Typically made from beige or off-white thin styrene. I think we've all heard how difficult it is to work with vacuum formed parts. Not necessarily so, if we're talking sails. All you need to do is carefully cut them out and trim the edges with pair of scissors and super-glue them onto the spars. If the kit is old stock, the vacuum formed sails may well be dented or ripped just from being bumped around. I've also heard novices thinking the vacuum formed parts look cheap. Either case, there are no alternatives that are easier and look better in my opinion. Injection molded sails is like any other part of the kit. They are often molded in white or off-white plastic. 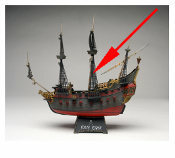 The injection molded sails are way too thick to look right and are difficult to be painted and weathered to look right. The vacuum formed sails typically look OK as they are. Personally, I prefer the vacuum formed sails, despite their flaws. I believe they are a lot easier to make look real than the injection molded sails. If you want to improve the appearance of any model sailing ship, the sails is where you'll see the most bang-for-buck. Generally the sails supplied with the kits are either white as snow or an almost skin tone. Neither is very accurate. Real canvas sails have a natural raw cotton color that bleaches out to a milky very slight off-white from the sun's rays and bleaching salt spray. For a super detailed ship, consider making sails from scratch using real fabric. This is really difficult to pull off, but can earn you at least a nod from your buddies and a ribbon at an exhibition. I'd only try this on the largest of ships, and use the finest of fabric, such as silk or very fine muslin. This is not for rookies though. One thing you may read in model ship building books is to color the sails in tea. Not a good idea. I have no clue how this practice got wind (excuse the pun), but the result is anything but realistic. A raw silk or cotton color is a lot more realistic. The running rigging are the sheets and lines to raise spars and trim the sails etc. They tended to have the color of, well, hemp rope. So, essentially a beige-brown-khaki type color. Both types of ropes came in several different diameters. This is rarely, if ever, represented on plastic ship models. Often the kits come with one, sometimes two spools of thread for the rigging. This is adequate for most builders. More important than using several different gauges of thread on the same model, is to default to a thinner of two diameters. If you're unsure which of two thread thicknesses to use, chances are the thinner will be less offending on the model. Shrouds and Ratlines on one of the more humorous pirate ship model kits - the "Jolly Roger" by Revell. You'll see these on small scale, really old, and less expensive kits. They are easy to install, but are way too clunky. The ropes that make up the ratlines are seldom round. To improve them, they can be scraped to a rounded shape, which is tedious work. The alternative is to make them from scratch. The bigger kits generally have ratlines that are made of soft plastic threads that have been fused together. It makes for a far more realistic look. They are more difficult to work with, but generally yield a better appearance on the model. I think it's been at least 30 years or so since one of the major model kit manufacturers released a new Age-of-Sail model kit of any importance. As a result, few of the kits available truly measure up to the quality we're used to in other categories. So for instance you'll never see photo etched parts, there is a lot of flashing and vent holes in the parts, details are often omitted or not very crisp. However, beggars can't be choosers, so just be prepared to take your time and fix the flaws to your own standard. 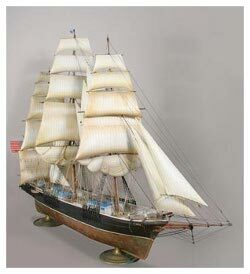 Below is some of the best Age-of-Sail plastic ship models available today from Heller, Airfix, Revell and Lindberg. The 1:100 scale HMS Victory is possibly the best Age-of-Sail plastic ship available today, with the Revell 1:96 USS Constitution a close second. The Sea Witch by Lindberg is not as detailed as the other kits in this size, but is excellent value. In this group, the Soleil Royale is the kit with the most accuracy issues. It can be finished to a beautiful decorative model nontheless. The 1:150 scale group above is another quality kits with good value. In this group the saying "you get what you pay for" holds true. Not that there are any losers here, but the Preussen and Passat are on top, followed by Le Superbe, Mayflower, Cutty Sark and Wasa. At 1:75 scale, the Nina, Pinta and Santa Maria of Christopher Columbus fame, could be built as a diorama. The scale is very close to common military modelling scales of 1:76 and 1:72, so there is no shortage of candidates to modify into crew figures and natives.